Bananas are exceptionally healthy food that provide numerous health benefits. It is a versatile fruit that contains many nutrients including vitamins A, B, C and E along with minerals like potassium, zinc, iron and manganese. Just as eating a banana helps in utilizing the banana nutrition to keep your body in good health and great shape, while application of this fruit on your hair and skin will help you to keep them in great condition. The banana benefits are many and they are discussed below! Don’t go for botox when you have bananas at home! 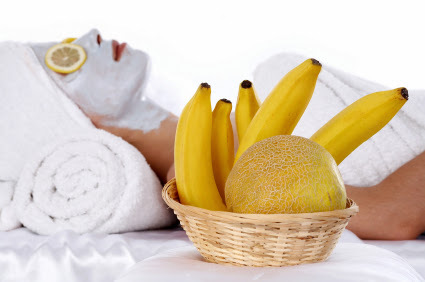 You can make a natural homemade banana facial that will give you a softer skin by moisturizing it. Here are some banana face masks that you can use to get that natural glow back on your face. 1- Mesh up one middle-sized banana and make a smooth paste then apply it on your face and neck. Wait for 10 to 20 minutes and rinse your face with cold water. 2- Cut or tear the banana into small pieces and place in your mixing bowl. Mash the bananas with a metal spoon. Add the honey and lemon juice and mix well. Apply mask to entire face and leave it on for 15 minutes. Rinse with a warm washcloth. 3- Another easy face mask to get moisturised skin is to mash half a ripe banana and mix it with 1 tbsp. yogurt and 1 tsp. Vitamin E oil. Apply it generously on a clean face and wash it away after 30 minutes. 4- Mash half a ripe banana and mix it with 1 tbsp. of sandalwood powder/paste and ½ tsp. of honey. Let it stay on your skin for 20-25 minutes and wash it with lukewarm water. This face mask is beneficial for oily skin as sandalwood helps in cleaning excess sebum and oil from the skin while banana keeps it moisturised. 5- Mash one ripe banana and mix it with lemon juice form one lemon (approximately 2-3 tbsp.). Leave it on for 25 minutes. This mask is full of vitamin C which will get rid of dullness and help in reduction of spots and blemishes. Mash together an avocado and a banana. Leave on skin for 25 minutes and rinse. Skin will be soft and youthful. The vitamins E in avocados combined with the nutrients in bananas fight free radicals and repair damage. Another simple face mask to fight effect of ageing is to mash 1/4 banana until very creamy and add one teaspoon of rose water. Apply it on face and neck and wash it off after half an hour. Mash the pulp of two ripe bananas and apply this pulp on clean, dry feet. Leave it on for 10 minutes and rinse the feet clean. The banana pulp will penetrate deep into dry, cracked skin to create soft and supple feet. Mash half a banana and apply generously around the puffy eyes. Let it sit for 15-20 minutes and then rinsing with cool water. You can also apply the banana peels instead of mashed banana. Mix ripe banana with avocado and add coconut milk to the mixture. Apply it on your hair and wait for 15-20 minutes. The pack conditions damaged hair and makes the hair soft. Instead of avocado, you can also make the same mask by adding cocoa. Presence of cocoa helps in bringing out the natural colour of the hair. Peel a banana and add 1/4 cup of olive oil and one egg white and put in a blender. Puree for a couple of minutes. Let it stay on your hair for 15 minutes followed by hair wash with your favourite shampoo and conditioner. To Treat Hair Loss, mix ripe banana pulp with yoghurt. Apply the smooth paste on your scalp and rinse with cool water after 15-20 minutes. Just like the way honey and banana face pack nourishes your dry skin, the same works great for your dry hair as well, mix three spoons of honey with ripe banana and apply it on your hair while it is still wet. Let the hair pack sit for 15-20 minutes followed by the usual hair wash.
Another simple yet effective hair mask to repair dry and damaged hair is to make banana pulp with a few drops of almond oil. Leave it for 10-15 minutes. The vitamin A and C present in banana along with Vitamin E of the almond oil leave your hair silky and shiny not to mention extremely moisturized and soft. cut a small piece of the peel. Rub the inside of the peel gently over the acne affected area. Rub for about 5 minutes or until the inside of the peel gets brown. Clean the skin around with lukewarm water but let the banana dry out on the affected area to do. Repeat this at least 3 times a day and the acne and pimples will subside within a week. just rub the banana peel on the effective area and you will feel the itching and swelling subside. Apply fresh peel on the affected area for 15 minutes every day and there will be noticeable change in a few weeks. So, Have you tried any of these masks yet ?? Which is your favourite mask ? Do Share your views in the comments. Disclaimer : These are not my own creation and not all the masks are personally tried by me. I have tried few of them and loved the result. These are all natural ingredient so it wont have any harm to skin or hairs. Please check and post on your blog <3 All the best! Figures that I would read a post about bananas when I don't have any at home hahaha. Gotta buy them asap! P.S. Giveaway On the Blog. had no idea bananas were so useful! I didn't have any idea that is can be used for so many different things. Great tips! I never knew banana'a could be so beneficial to your skin.